The Russian Tsar Nicholas I (1835-1855), attempted to supress and isolate the Jews and to take away their autonomy, including controlling Jewish publishing and Jewish books. Pro-Russian maskilim, or enlightened Jews, took advantage of these policies and would sometimes report uncensored Hasidic Jewish libraries. 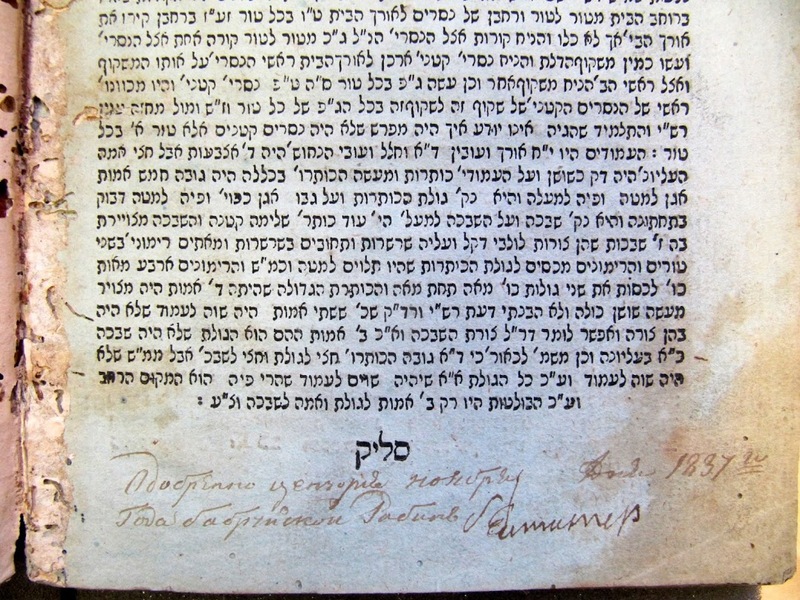 The maskilim hoped to counteract the influence of the Hasidim, who published a large amount of devotional and hagiographic literature. As a result, in October 1836, the minister of internal affairs, Count Bludov issued a new, stricter censorship law. According to the new legislation, all uncensored books should be presented at the local police within a year, so that a special commission of rabbis would examine them. The suspicious or unsuitable ones were to be reported to the Ministry of Internal Affairs. Furthermore, all Hebrew printing houses were to be closed down except for two (one in Vilna and one in Kiev) which would have their own censors. This entry was posted in Uncategorized on 3 November 2014 by .